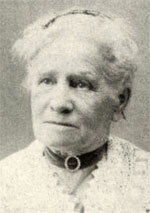 Biography of French anarchist Victorine Brocher-Rouchy, who fought in the Paris Commune and, in making her escape from the repression, was forced to leave her husband behind. Victorine Malenfant was born in Paris in 1838, into a family with a long revolutionary tradition. Her father was a republican shoemaker and freemason. She became involved in republican and socialist activities in the 1850s. She married Jean Rouchy, an artisan shoemaker, in 1861 and participated with him in that decade in Orleans and Paris in several socialist groups, becoming involved in the First International from very early on. With her husband she was active in the Paris Commune (pictured above with a toppled statue of Napoleon), joining the Battalion for the Defence of the Republic with her husband on 20th March 1871. They were in charge of the officers’ mess, but with the outbreak of fighting, she returned to her post of ambulance driver. She fought on the barricades during the whole of the Bloody Week. With the savage repression that followed, she was arrested and condemned to death for burning down the Court of Accounts (Cour des Comptes). Thanks to her friends, she managed to escape first to Switzerland and later to London, while her husband was imprisoned and died in captivity. She returned to Lyon and then to Paris in 1878, and became very active in the anarchist movement. She was a member of the group that published the anarchist paper La Révolution Sociale. She met Gustave Brocher whilst attending the International Anarchist Conference in London as a Parisian delegate in 1881. They later married and adopted five orphans of the Commune. In 1909 she wrote her memoirs up to 1871, Souvenirs d'une morte vivante (memories of one of the living dead). She died in Lausanne on 4th November 1921.